1. One bedroom with a/c, ceiling fan, HDTV, screened windows, towels and bed linen provided, one Double Bed, a 30x72 inches roll-away cot. Ask for availability of twin sized bunk bed to sleep four. The rental apartment which is situated at Tamarindo Estates - a small, intimate rental complex which contains only 12 simple and comfortable apt. units as the one described, in the midst of a large division of virgin and undeveloped 60 acre estate. While Tamarindo Estates is nicely secluded, it is an easy 5-minute drive from town. The rental apartment is receded to the back from the beach and sits high on a hill, thus allowing very nice ocean views from higher up. Regarding REVIEWS, your host and owner, Jose, has received over a hundred very good and excellent travel reviews on his Tamarindo rental apartments in Culebra. Please contact Jose for more information. AREA ATTRACTIONS: * Home to Culebra's National Wildlife Reserve under the U.S. Fish & Wildlife Service. *Culebra is home to Flamenco, rated one of America's top 10 beaches. * Easy access via San Juan airports and the airport and seaport of Ceiba, PR. TRANSPORTATION TO CULEBRA ISLAND: : The easiest way to reach Culebra is via San Juan, Puerto Rico. The flight from New York to San Juan takes 3 1/2 hours; from Miami to San Juan it's 1 1/2 hours. San Juan International Airport (SJU) is served from the U.S. Mainland by Jet Blue, Delta, US Airways, Continental, Northwest, Spirit Air, American Airlines, and United. From the rest of the world, San Juan (SJU) Airport is served by Air Canada Vacations, Canadian Airlines, British Airways, Lufthansa's partner Condor, Copa Airlines, and LACSA-Group Taca. Culebra has daily flights arriving from San Juan International Airport (SJU) and Isla Grande Airport (SIG) on Vieques Air Link and Air Flamenco. Passenger ferry boats are available from Ceiba, PR, a sea port on the east shore of Puerto Rico. For the taxi drive between San Juan and Ceiba you should allow between 1 1/2 and 2 hours, depending on traffic. AMENITIES: * For your privacy and tranquility, there are only 12 apartments in the Tamarindo property where this rental unit is located. * A beach-house for taking shade while on the beach, and restroom facilities. * Easy walk-in snorkeling just off our water front in pristine waters. * Rental unit is located in secluded neighborhood, yet only a 5 minute drive to town. PLANE vs FERRY from Mainland Puerto Rico. : Unless you can buy the ferryboat tickets online ahead of time, we strongly suggest that you take the plane as opposed to the boat to get on time for check in. The ferries may run late or not at all and you may have to take the next available ferry. toilet, shower, A lavatory, toilet, and shower stall in the bathroom. On the west side you have the ocean, on the other side a mountain view. Secluded in exclusive neighborhood about seven minutes drive from town. Easily walk in from the Tamarindo Estates beach-house to close-by remarkable offshore snorkeling spots. The rental apartment sits farther inland, in the hilly vegetated interior. A landline courtesy phone is provided for local or toll-free calls. Window type a/c in the bedroom. There are two laundromats in town. Plenty of free parking available. No need to reserve ahead of time. Free Wifi: Guest will be provided at time of check-in with the passwords for our WIFI networks. There is also internet service on the property from the ATT Wireless network. Regular type towels provided, not beach towels. Ceramic top, electric cooktop (not a stove or oven) is provided. Basic cooking utensils are provided, and dishes and cutlery for four. This kitchen is private for this rental apt and is not shared with other units. Guests may dine on the living-kitchen area of the apt or on the apt's porch while enjoying ocean views. The 1-BR apartment has a roofed porch with ocean views. On the next door beach, 4 minutes walk, three independent operators provide kayaks, kayak tours and snorkeling trips. --Living on-site, a short distance from the rental unit, a Resident Caretaker is available on-call 24 hrs a day. --A beach-house, with restroom facilities, is provided by the beach, for taking shade while on the beach area. 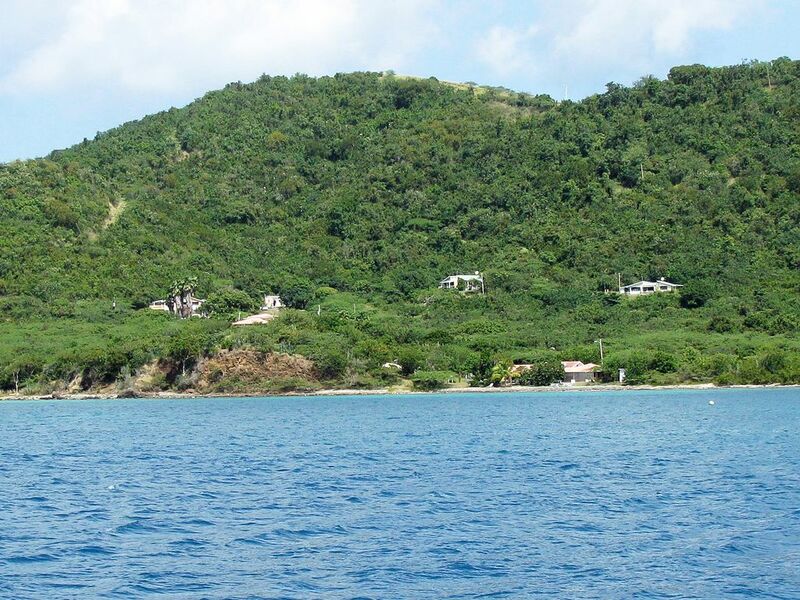 --Easy walk-in good snorkeling just off our beach in pristine waters. --For the more adventurous, easy and exciting kayaking across one mile from the rental apt. to the Luis Peña Cay. --For his privacy, rental guest is provided with a beeper to open a gate that leads to the private grounds surrounding the rented lodging. --You may ask owner to provide access to over a hundred travel reviews on this property. There are no passports or visas necessary for U.S. citizens. U.S. citizens can travel in and out of the island without going through immigration or customs. Culebra is one of Puerto Rico's off-shore islands, 10 miles square in area and 17 miles east of Puerto Rico. It is located midway between P.R. and St. Thomas, U.S.V.I. Presently there are about 2000 residents on the island. Culebra was discovered by Christopher Columbus in 1493 and was under the Spanish flag until 1898 when Puerto Rico became part of the United States. Presently, the Commonwealth of Puerto Rico enjoys a special status of self-government under the U.S. flag.